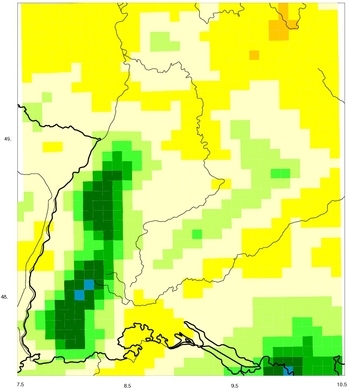 The task of the project ReSiPrec is to perform high-resolution regional climate simulations and to analyse them with respect to future average and extreme precipitation in the state of Baden-Württemberg. - using the regional climate model (RCM) COSMO-CLM – as well as existing simulations from a variety of RCMs (CLM3, REMO, ENSEMBLES simulations) are combined to establish a so called ensemble. This ensemble contains RCM simulations which cover climatological time scales (several decades) with high spatial resolution. The final step is the application of these methods to achieve an estimate of the changes of (extreme) precipitation within the next decades. The main projection period is 2011 - 2040. 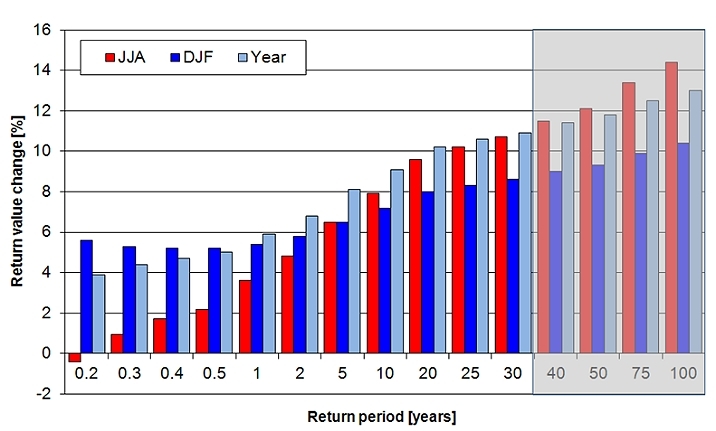 Model evaluation is a necessary step to show the reliability of the model results. It is an essential component of ReSiPrec. 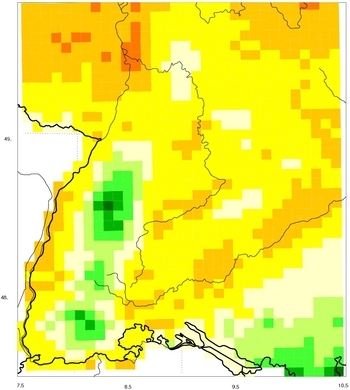 A first study "Feldmann et al., 2008" focuses on the evaluation of precipitation climatologies including regional patterns, annual cycle and distribution of precipitation intensities. The winter precipitation in regional models depends strongly on the input of the global driving model. Large scale precipitation is dominant during winter. Neglecting processes like advection of precipitation causes a spurious windward shift of the precipitation maxima. With respect to extreme events the regional simulations reproduce the regional distributions well (compare Fig. 1). Like for the mean precipitation there is a tendency to overestimate the extremes as well. More detailed results can be found in "Früh et al., 2010". 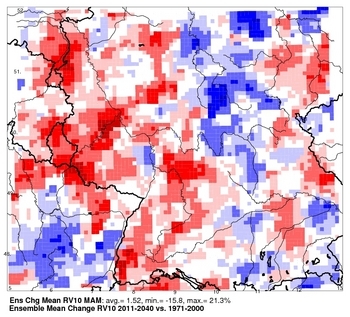 "Früh et al., 2010"; "Schädler et al., 2008". Fig. 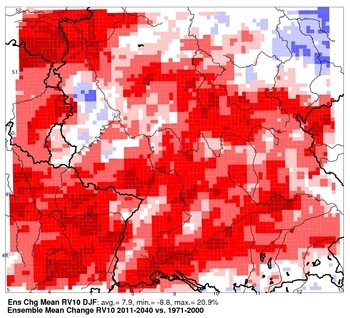 2: Near future changes of extreme precipitation in Central Europe. 10-year return value of precipitation - relative change [%] 2011 - 2040 vs. 1971 - 2000 - mean for an ensemble of CCLM simulations. Fig. 3: Near future changes of extreme precipitation for different return periods and seasons- relative change [%] 2011 - 2040 vs. 1971 - 2000 - mean for an ensemble of CCLM simulations. 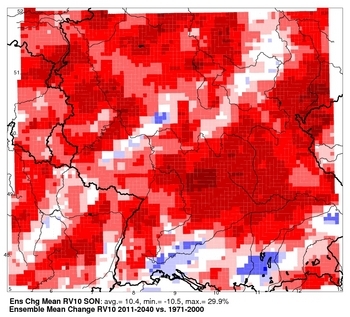 The majority of the RCM simulations indicate an increase of precipitation variability. Increased variability makes extreme periods including very wet seasons and droughts more likely; however, the results depend strongly on the driving GCM data. Changes in the actual emissions have a delayed impact. This means that the choice of the emission scenario has only a minor influence until the middle of this century. It is likely that the precipitation trends observed in the recent past and described in detail in the KLIWA project will prevail at least for the next decades. This implies a shift of the annual cycle with an increase in winter precipitation and dryer summers with only small changes in the annual total precipitation. The intensity of extreme events is expected to increase in all seasons. 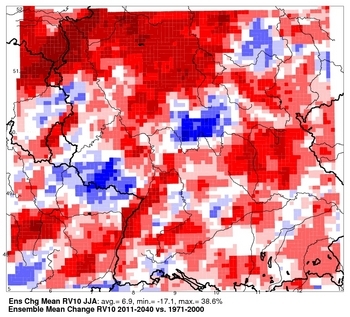 During winter the increase of extremes is consistent with the increase in mean precipitation for this season. During summer – when there is only yet a slight tendency towards less precipitation for the next decades – stronger regional variations of the climate change signal are expected. This leads to an intensification of extreme precipitation events in some regions and a decrease of the intensities in other areas in Middle Europe. The increase in the intensity of extreme precipitations gets larger for longer return periods. Hochauflösende regionale Simulationen künftiger Starkniederschlagsereignisse in Baden-Württemberg (ReSiPrec).